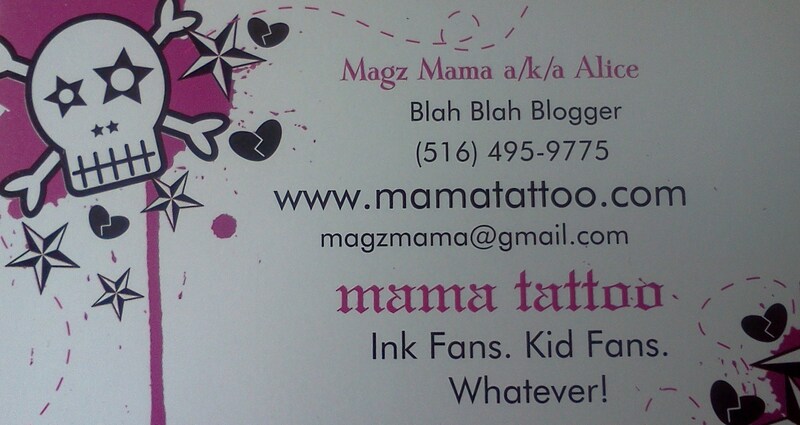 This blog is about and for moms, non moms, tattooed people, non tattooed people, people who want to get a tattoo and all men and all women. That covers it, I hope! I’m an undertattooed late-mid-40s (hah hah) mother of one kickass 7 year old. I live in the suburbs and I love to write. And my goal is to have one, maybe two sleeves (even half sleeves would be fine) before I croak. So, relax and look around. You’re going to find some weird stuff in here, much of it I hope you’ll find entertaining. I hope you’ll leave me some comments here on the site, but if you prefer, you can email me directly at magzmama@gmail.com. I want your feedback, your love, your snarky responses. I hope to get a tattoo before I’m 30. I’m 27. Not sure if that’s going to happen if I keep spending my extra income on stupid stuff like utility bills. Oh now I’m all for skimping on utility bills for a little ink! No, seriously, if there’s something specific you feel you need and want, then squirrel away a little cheddar each week or month for your own specific Andrew Fund! It’s worth it, if you feel that need.